In the Japanese language an “n” (ん) followed by a “b” or “p” consonant is always pronounced as an “m” sound. For example, although it is actually written kanpai, the Japanese equivalent of “cheers!” is pronounced “kampai!”, of course. There is no single “m” consonant, in fact, there is only the ん as sole single consonant (which is not necessarily followed by a vowel). This may lead to some confusion when Japanese transliterate foreign words in the Latin alphabet (romaji). 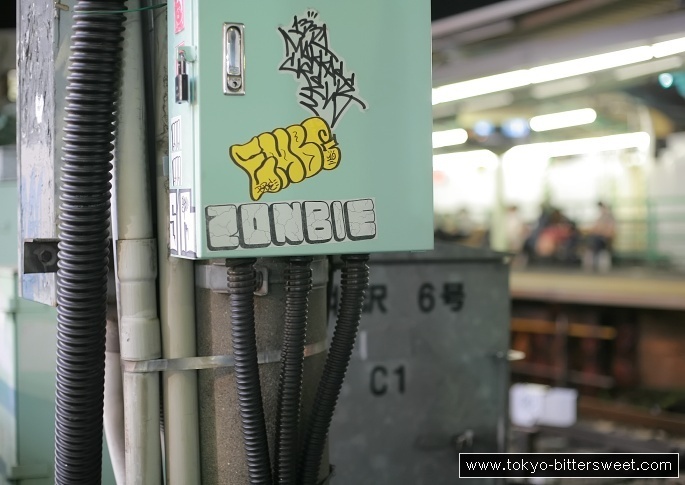 So that’s why this “Zonbie” sticker near Shimo-Kitazawa station gave me a chuckle — Japanese street poster artists trying to be cool and Western, but still couldn’t shake off their Japanese way of thinking about language.